Priscilla Meyer, chair and professor of Russian, East European and Eurasian studies, is the recipient of a 2014 Excellence in Post-Secondary Teaching award, granted by the American Association of Teachers of Slavic and East European Languages (AATSEEL). AATSEEL exists to advance the study and promote the teaching of Slavic and East European languages, literatures, and cultures on all educational levels. 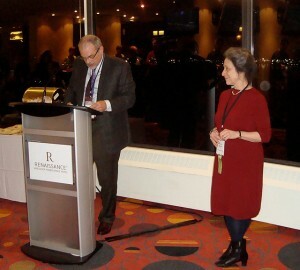 Meyer received her award during the the 2015 AATSEEL Conference Jan. 9 held in Vancouver, British Columbia, Canada. The event featured scholarly panels, supplemented by advanced seminars, roundtables, workshops, informal coffee conversations with leading scholars, and other special events, such as poetry readings and receptions. Priscilla Meyer received the prize from AATSEEL President Thomas Seifrid of the University of Southern California. Wesleyan graduates Lindsay Ceballos ’07 and Emily Wang ’08, both Ph.D. candidates at Princeton University, delivered papers at the conference. At Wesleyan, Meyer teaches courses on 19th and 20th century Russian literature. Her research interests include intertextuality, French and German sources of the 19th century Russian novel, and works by Russian novelist Vladimir Nabokov. Learn more about her research here.